Keeping the last Star Wars film under wraps was no church picnic, but at least the probe droids were part of the set. 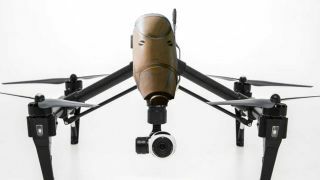 This time around, drones - possibly very much like these ones - are being sent in by the prying public, giving director J.J. Abrams an extra thing to worry about. Mark Hamill, who's set to reprise his role as Luke Skywalker in The Force Awakens, revealed that he had to take a few extra precautions to evade airborne snoopers. "You know, the security on it is just crazy," he said before a screening of his new film Kingsman: The Secret Service. "I'm surprised I can even admit I'm in it… I like being surprised. It's a whole different era now. When we made the original films, you had the odd reporter hanging around the studio bribing people to give them stories." "Now, I said to them, 'Do I really have to wear this robe and this hood that covers my entire head to go from the trailer to the soundstage?' They said, 'Yeah, there's drones.' Seriously! There's drones flying over the studio trying to get pictures of whatever they can get pictures of." Never tell me the odds! Just give me the blips.